This the fifth post in an in depth series which examines Adult Onset Diabetes, or, as it is also caused, Type II Diabetes. We’ll abbreviate it to AODM. “Standard Practice” for treating diabetes seem entirely counterproductive. There is ample research point to this, and it logically makes no sense. 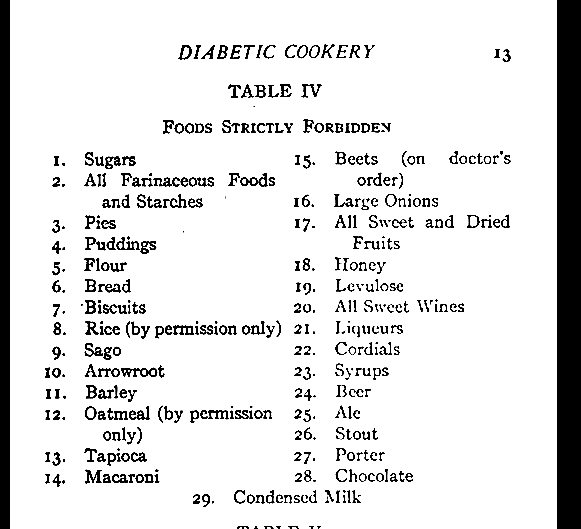 Here is an excerpt from a 1917 book, easily available online, called “The Diabetic Cookbook.” It has this list of forbidden food. This book goes on to allow freely: all meats, fish, poultry, dairy, all sorts of fat, most colored vegetables. This was the right diet. It worked then, and it still does. Now this book was written for Type 1 diabetics, but dietary needs are identical for AODM. This diet is very pointedly trying to minimize glucose. We are in total disagreement with these specifics, but why should you believe us. We seem to be enamored with a 1917 cookbook. Are we hopelessly out of date? Wake up institutional medicine! If the problem is an inability to metabolize glucose, what is the obvious solution? We don’t give alcoholics more alcohol. We don’t give addicts more drugs. Why is AODM any different? Due to the mechanism of insulin resistance, sugar/starch has become an addiction. Fat is not the problem. Glucose is the problem. Why complicate things? Cut out sugar and starch and get well. Sugar and starch exacerbate the problem. Fats reverse it, and this includes saturated fat. Without exception, cutting glucose has reversed AODM for every Quantitative Medicine patient that presented with it and followed the protocols. The 1917 cookbook shows that we once had it right, but things changed. There are political agendas and history at work here. Baby boomers and beyond will remember the dietary advice that preceded the Food Pyramid. There was the idea of a balanced diet, represented by a plate, divided in thirds, with a meat, vegetable, and fruit portion. Sounds sensible, and it more or less was. Then along came the demonization of cholesterol, the demonization of saturated fat, and the demonization of red meat. These three dietary witches were simultaneously burnt at the stake with the introduction of the Food Pyramid. At the base were breads and cereals, then came fruits and vegetables. Over half the pyramid was starches and sugary fruits now. Dairy, beans, nuts, meats, eggs, and oils then competed for the tiny space at the top. Whole grain got promoted to the level of wonder drug. This was shock treatment. A huge change in recommended food consumption patterns. The high priests of nutrition were absolutely, positively sure this would cure all health problems past, present, and future. So 40 years later, what have we to show for this? An adult onset diabetes epidemic, and the food pyramid did nothing to cure this. It caused it. Make no mistake about that. What were they thinking? Hunter-gatherers, who never get AODM (as long as they stay away from us), wouldn’t even recognize the bottom bread and cereal layer as food. But so confident are the gurus, that all this sage advice lives on. There are rebellions brewing here and there, but high starch, low-fat is still the mainstream advice. We suppose they intend to keep it going until it works—or we all die from it.